I've been a quinoa (pronounced keen-wa) convert for quite some time. Not only is it a complete protein in nutritional terms, which is great for non-meat eaters like me, but it's also actually rather tasty. It might not look it - it's a pale grain like any other and I have to admit that I wasn't completely taken with it the first time I tasted it plain (although it does have a strangely moreish nuttiness). 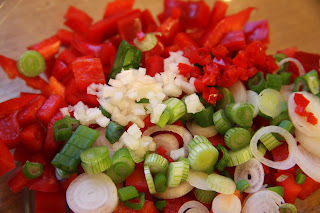 But once I began to experiment with it, mostly in salads and pilaf, I decided it was pretty good stuff. Added to which I feel rather virtuous when I eat it because of its goodness! OK, technically it isn't a grain. Despite the Incas, who considered quinoa to be sacred, calling it chisaya mama (the mother of all grains) it is apparently a wannabe-grain (or psuedograin as the experts would have it). A grain-like crop. It has been a staple food source in the Andean region of South America for thousands of years but it seems that it's significance for our modern diets (and in particular vegetarian and vegan diets) has only received increasing attention over recent years. Whilst shopping in Paris last month I spied a packed of red quinoa which I had read about, but never seen before. I snapped myself up a little bag and brought it home to London to try out. 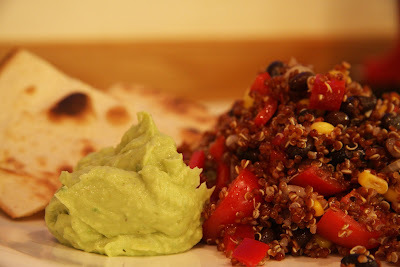 Actual recipes for red quinoa proved to be far and few between so I came up with the idea of using Mexican flavours to create a red quinoa chilli salad...black beans, corn, red chilli. I served it with guacamole and tortillas, but to be honest, the guacamole overpowered it a bit so next time I think I would make a side salad with the avocado instead (and use less lime!). 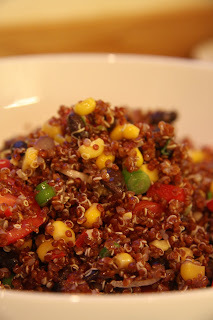 Cook the red quinoa. I do this by washing the grains in cold water, putting them in a dry pan for a couple of minutes until they start popping slightly, then covering them with water and simmering with the lid on for around 10 minutes until cooked but still with some bite. There's something incredibly decadent and indulgent in treating yourself to a long, lazy lunch on a weekday when everyone else is at work. Even more so when you choose Galvin at Windows for your special treat! Last Friday I'd taken a day's holiday to forget about the world of work and start my weekend off with a bit of 'me' time, which in my case invariably involves food, a glass of bubbly and, well, maybe some more food. Armed with a good book in case I got bored (which I didn't) of staring out over London from the 28th floor of the Hilton on Park Lane, I made my way in good time for my 1.30pm reservation at Galvin at Windows. Of course, I managed to get lost (which is rather difficult seeing as all I had to do was walk from Marble Arch down Park Lane, but, if you know me, is no surprise - I'm not known for my sense of direction) which meant I arrived bang on time. I was a little apprehensive about going to such a grand restaurant on my own. Don't get me wrong, I am certainly not averse to eating alone when there's noone around to join me, but I'd never done the starched white table cloth and attentive service thing alone before. I really need not have worried. In fact, I'd do it again in a jiffy! There was no little table in the corner out of sight of the other diners for me (as I had feared). After a warm welcome I was shown to a table in amongst the other diners and, incidentally, right behind another solo diner - a gentleman who, I am told, eats there alone about three times a week and who certainly seemed to be a part of the Galvin family. 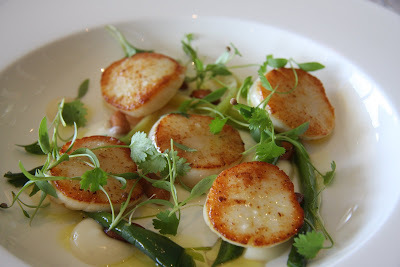 My starter of seared Scottish scallops, crispy peanuts, curry oil, cauliflower puree & braised leeks was, quite simply, divine. Perfectly cooked, sweet scallop and velvety cauliflower puree. The crispy peanuts were unusual but worked well with the other flavours and the crunch added texture and lifted the dish. 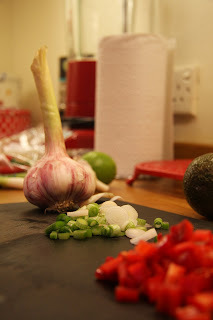 My only criticism (if I was really scrabbling for one) would be that the baby leeks were a tad difficult to cut so I had to hone my eating-things-without-looking-silly skills. For mains I had toyed with the idea of the fillet of braised turbot over fresh peas, girolles, braised gem lettuce & light jus gras, but the 'jus gras' is made with veal stock, so on the waiter's recommendation I went for the 'lighter' seared fillet of wild sea bass, braised fennel, tomato & sauce vierge. I'm not sure whether his recommendation was based on his view that I needed to shed a few pounds or that I might be a lady who lunches for whom light is the key. Whichever way I was happy with my choice, with one exception - the coriander shoots. Why, oh why are chefs obsessed with these micro shoots? They look pretty and add some vibrancy, granted, but the overpowering taste of coriander (which to some people tastes like dirty wet pet hair smells) is too much. 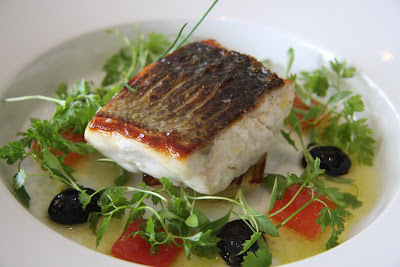 So, having scraped them all to one side of my plate I continued - with each forkful some tender sea bass, crispy skin, sweet tomato flesh, salty black olive and the simplicity of a good quality vinaigrette. It was light as the waiter had promised. And simple. The choice of a vinaigrette over a heavier sauce was genius and one I plan to replicate at home this summer. All washed down with a glass of Chablis. Just as the waiter was about to take my plate away I realised there was lovely juice left so promptly mopped it up with my last scrap of the sourdough. Delightful. Next stop - the dessert menu. Now, had I not been dining alone there would have been no competition. The tarte tatin. I'm going back at some point just to taste that beauty! Before I could make my mind up, Michele (the Restaurant Manager) offered me a tour of the kitchens which I jumped at. It amazed me how calm it was in there - I guess I had expected shouting and crashing and banging Ramsey-style. We stepped out onto a balcony out the back of the kitchen to a view which is out of this world. 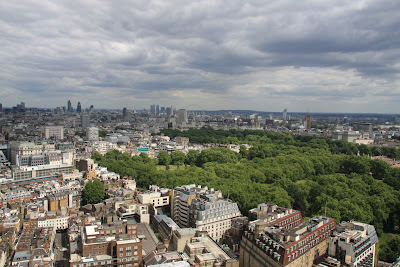 As Michele and I chatted about work/life balance and the best Italian restaurants in London we gazed out over Buckingham Palace to the right, the City ahead and Crystal Palace in the distance. It was breathtaking. 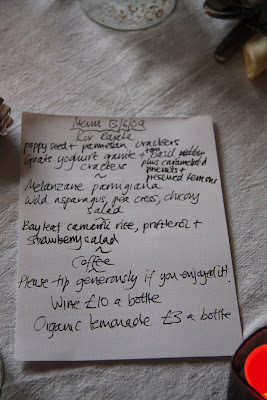 On the way back to my table I asked the chefs on the dessert section what to choose and received a resounding vote in favour of the strawberry panacotta with wild strawberries. Oh my were they spot on! The plate looked so pretty and summery - a small rich, smooth panacotta topped with strawberry jelly with the most amazingly intense flavoured wild strawberries on the side. Every mouthful was a joy. It was my first taste of wild strawberries and I was amazed at how something so small can taste so good. By now I felt right at home and could have settled in for the afternoon! 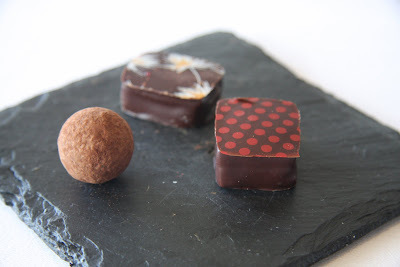 Coffee came in the form of a double espresso (followed by another which rendered me useless and on a caffeine high for the rest of the afternoon) served with salted caramels, madagascan truffles and chocolate coated raspberry jelly truffles. They looked exquisite! Just to be sure that the raspberry one was as good as I thought it was I had to ask for some more and prepared myself to have to be rolled out of there. It was a truly memorable lunch for all the right reasons - amazing setting with the views over London, attentive and friendly service and damn fine food! A final note to Fred - you must do the tarte tatin competition and count me in! Well, aren't I the lucky one living so close to Ganapati?! 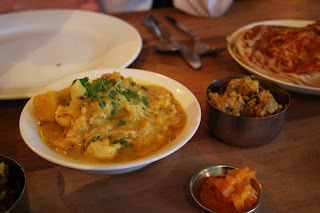 There is a plethora of Indian restaurants in the East Dulwich area and everyone seems to have their own favourite. But which one to try? I could have tried the ones which seem to be recommended most on the East Dulwich Forum or started at the top of Lordship Lane and worked my way down, but to be honest since we moved here the majority just haven't appealed. We've had some good take aways from The Indian Dining Club in Sydenham which has a good choice of vegetarian dishes (which aren't just huge chunks of peppers swimming in an oily tomato sauce...) but it's not the easiest place to get to from where we live without a car which rules out having a beer. 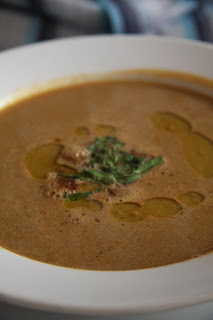 I've known about Ganapati for quite a while, but it wasn't until I read Helen's review on her Food Stories blog that I finally got around to booking a table last Tuesday evening. 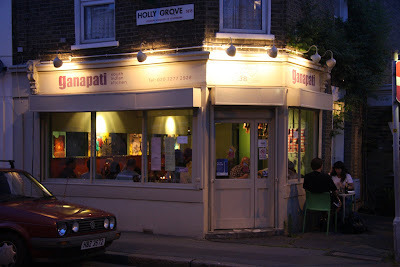 Ganapati serves South Indian home-style and street food, the likes of which you would find being dished up in the homes or served on the stalls by the side of the roads in Southern India. They have a short (but more than adequate) menu which changes regularly and boasts a large number of vegetarian dishes, in fact the majority of the starters are vegetarian. 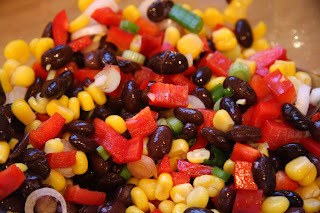 Great for non-meat eaters and omnivores alike. Andrew magnanimously let me choose all of our dishes for us to share (probably because I was like an over-excited child in a sweet shop when I saw the menu!). We started with the Vegetarian Street Snacks - 2 Mysore Bonda (spicy potato balls fried in chick pea batter) and 2 Parippu Vadai (patties of ground chana dal with ginger, curry leaf and green chilli) which came beautifully presented on a banana leaf and shouted 'Eat Me'! Perfect for sharing. 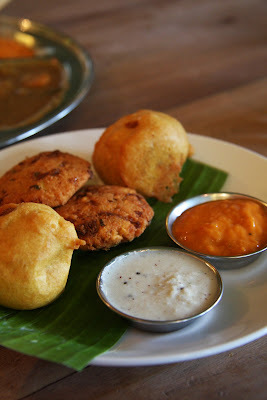 My favourite were the spicy Parippu Vadai which looked a bit like mini flying saucers. They were highly spiced and so moreish. I had high hopes for the Mysore Bonda which looked so pretty, but I felt that the potato mixture inside lacked a little heat (although that could be because I ate the Parippu Vadai first). Our other starter was the Masala Dosa - a rice flour and lentil pancake stuffed with spicy mashed potato and served with sambar and chutneys. 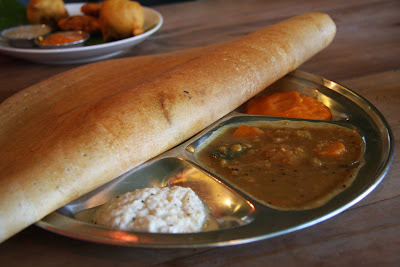 The dosa was huge! The potato stuffing was lightly spiced and worked well with the sambar. I made the mistake of putting too much of the red chutney on my first mouthful and it nearly blew my head off. Lesson to self - try the chutneys first! I have to admit that by this stage I was beginning to feel really rather full...but I pushed on to our mains of Paneer and Peas Masala (paneer in a tomato, onion and green pea masala) which came served with pickle, thoran and a Keralan Paratha and Pumpkin, Sweet Potato and Cauliflower Curry (a vegetable dish cooked with chana dal in coconut milk and spices with fresh coriander) which was served with thoran, pickle and raitha. The large chunks of paneer came in the most glorious masala sauce. 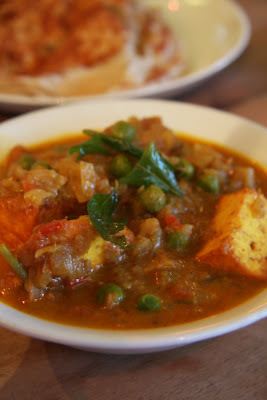 Quite often paneer is lost in dishes or is rubbery and tasteless. These pieces had taken on the flavours of the masala, were moist and a delight to eat! This was my favourite of the mains by far. The Paratha was simply amazing. 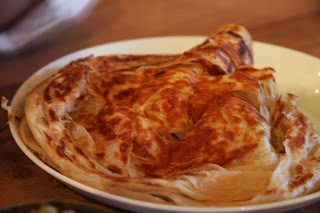 I've never had paratha (an unleavened bread cooked on the griddle or tawa) before so I have nothing to compare it to, but then I don't need to as it was delicious flaky, rich and buttery bread which went perfectly with the Paneer and Peas Masala. We upgraded our plain boiled rice for Curd Rice (Sona Masori rice and yoghurt tempered with mustard seeds, curry leaves, ginger and green chilli) which was lovely on its own but, aside from the sourness of the yogurt which was refreshing in contrast to the heat of the curries, its delicate spicing was a little lost amongst the spices of the other dishes. I only wish I'd had more room to eat more! In fact I think I'd go back just for the thoran. You may have heard by now about the latest London phenomenon of the so called 'pop up' or 'underground' restaurants... They've been around for years in other parts of the world and so too here in London, but this year seems to have seen a proliferation of these 'secret' eating places, where home cooks open their doors to complete strangers and serve restaurant quality food in return for a 'contribution'. And everyone seems to be writing about them. We set off on the mighty trek from South East London to Kilburn a tad later than we'd hoped. There was no way I wanted to be late. I'd been looking forward to this all week. As is always the way in London, wherever you want to go at the weekend is usually the most difficult place to get to and yesterday was no exception thanks to the closure of the Jubilee Line. But, 2 trains, 2 buses, 1 tube, a bit of walking and nearly 2 hours later we were knocking on the door of the Underground Restaurant 5 minutes ahead of schedule. Our wonderful waitresses for the evening, Ali and Lenny, welcomed us in, fostered Kir Royales on us and left us to choose our seats at one of the pretty tables set up in what is usually MsMarmiteLover's living room. It was a bit like being first to arrive at a party. I drank my drink too quickly and wandered to the kitchen to find out what was going on. I think I expected the kitchen to be a scene of carnage but in fact it was surprisingly calm. And tidy. I introduced myself to MsMarmiteLover and Shuna - guest chef for the evening - and tried not to get in the way (well, not too much). 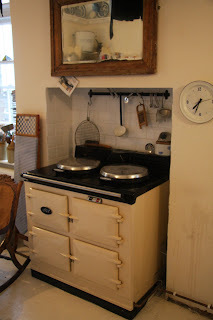 The kitchen with its wonderful aga was a hive of activity and it was great to have a first glimpse at what we were about to eat. I wandered back to the 'dining room' and introduced myself to the other diners. It soon got to the point where we had to sit down - there just wasn't enough room to stand in and around the tables with 32 people (the most so far I think MsMarmiteLover said). We were joined on our table by the lovely Jo, Sarah, Becky and Kirstin who made excellent dinner mates for the evening. And that's the whole point of this...it isn't just like going to eat in a restaurant with your husband, wife, friends, colleagues. It's like going to a great big dinner party where you don't know any of the other guests. You sit at a table with people you have never met before and that is a crucial part of the whole experience. It's refreshing. To kick us off, Ali came round with a huge platter of parmesan and poppy seed biscuits. 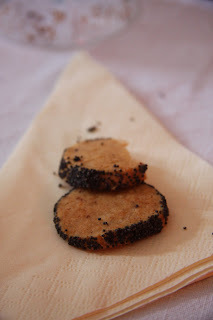 Small rounds of rich, buttery biscuits packed with parmesan which had been rolled in poppy seeds. A lovely accompaniment to our aperitifs and much needed to put me on until the starter was served. With our kirs finished, a £10 raffle ticket 'won' us a bottle of Cabernet Sauvignon. Not one we would have chosen ourselves, but a tasty wine that drank well...far too well! 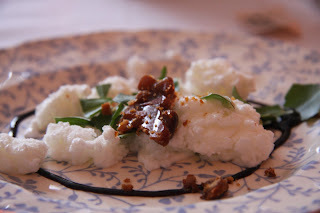 The starter was something I'd never heard of let alone tried before - goat yogurt granite with caramelised pine nuts, preserved lemon and basil. Wow. Totally innovative and great to be served something different, something I'd never have thought of making. The cool, icy granite worked perfectly with the caramel flavours of the pine nuts and then, every so often, you'd come across a tiny piece of the preserved lemon or basil which was a little surprise on the tongue. It was served with seed crackers which, whilst lovely, weren't the perfect match for me - I think I would have gone for a plain cracker or a savoury biscuit. The atmosphere was lively and friendly. The whole evening had a very 'communal' (if that's the right word) feel - I chatted to the girls on our table, the people on the table next to me, lots of people on the balcony and whoever I stumbled across on the way to and from the kitchen (where I couldn't resist disappearing every so often to see what was going on behind the scenes!). You wouldn't get anything approaching this sort of an atmosphere in a restaurant unless you booked the whole place out and filled it with your friends. Ten out of ten. 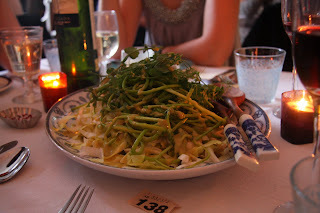 Next came a huge plate of salad - endive, wild asparagus and pea cress with a lemon and mustard dressing - from which we served ourselves. The bitterness of the endive (one of my favourite lettuces) contrasted well with the sweet wild asparagus, which was a simply lovely vegetable. I don't think any of us were particularly dainty in eating the long thin slippery stems! 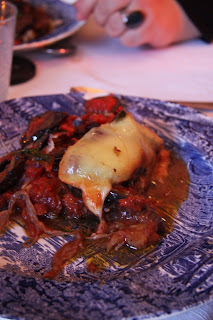 Main course was Melanzane Parmigiana - melt in the mouth aubergines, a rich tomato sauce and a healthy portion of melted cheese. It's not the sort of dish you see on restaurant menus very often (although The Greenwich Union do a nice one) and by all accounts that's because of the labour intensive aubergine preparation involved (which judging by MsMarmiteLover's twittering the night before was a little wearing after batch three hundred and fifty nine...). It wasn't a particularly pretty dish but my word did it pack a punch. Aubergines are one of my favourite vegetables - so versatile for vegetarian cooking as they can form a centrepiece for those who miss the 'meat' element of a meal or, as they did here, blend perfectly with other ingredients. One of my dining companions had never eaten aubergines before but she loved the dish and will be going back to Scotland as an aubergine convert! Finally, to round off the meal we were treated to Shuna's inventive dessert of Profiteroles with Bay Carnoli Rice and Strawberry Salad. What a treat! Light aga baked profiteroles filled with a creamy rice pudding flavoured with bay leaf piled on top of a salad of super fresh strawberries with herbs (there was definitely tarragon and rosemary in there). Goodness knows where Shuna's inspiration comes from but it works. I watched her lovingly chopping all of the strawberries by hand before adding her herb mix. 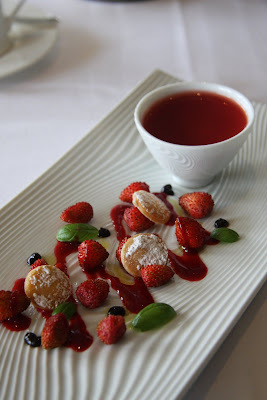 This is the sort of dessert that I've never seen on a restaurant menu but would love to! As the evening began to draw to a close, some diners drifted away and MsMarmiteLover came to sit with her guests for a good old chin wag. She has seemingly boundless energy - photographer, food blogger, mother, home cook, restaurateur, the list goes on... I wonder does she ever sleep?! Before we knew it it was midnight and any chance of making it back south of the river by public transport long gone so we ordered ourselves a cab, said our farewells to our fellow diners, the lovely waitresses, our hostess and her guest chef and headed homeward feeling warm and fuzzy, well fed and thoroughly happy. How many places do you go out to eat where you kiss everyone goodbye before you leave...? 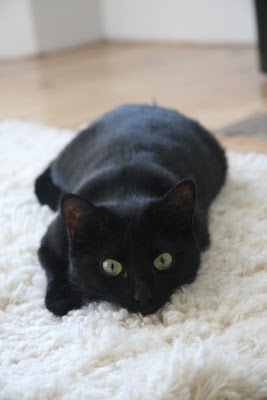 We became the proud owners of a beautiful little black cat yesterday and to celebrate her arrival I decided a champagne cream tea was in order! I've been fancying a cream tea for a while - I think it's the first sign of sunshine that does that...the decadence of spending lazy summer afternoons eating light buttery scones with lashings of jam and cream. Apart from the cream I don't suppose a cream tea is particularly cat-friendly and there wasn't any sunshine to be had yesterday as the rain poured down in torrents. But it was certainly fairly decadent to be sitting around sipping champagne and eating these little beauties! 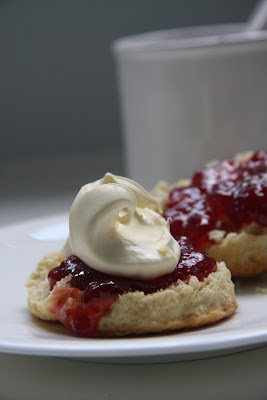 Now it seems that even something as simple as a cream tea can cause great debate... What flavour jam? What sort of cream? Cream or jam on first? How do you pronounce 'scone'? Fruit scone or plain scone? Cream teas originated in Devon where it is customary to split a freshly baked scone, cover each half with Devonshire clotted cream and then spoon strawberry jam on top. It has to be a plain scone, proper clotted cream (none of your whipped cream nonsense) and strawberry jam. Sounds about right to me, but with one exception...tradition or not, I like to spread my jam on first and then I can spoon on as much clotted cream as my scone will take. I'd rather have just the one scone with serious artery clogging quantities of cream than two sparsely coated scones. 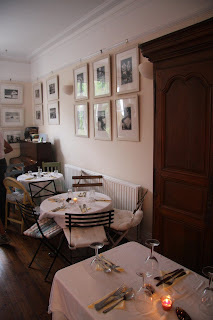 And so it was that we found ourselves eating cream teas, drinking champagne and feeding the cat clotted cream off a teaspoon on a cold and miserable Sunday afternoon in June. Mix the flour and butter until the mixture resembles breadcrumbs and then add the sugar. Beat the egg, then add the milk to the egg and mix. Add the egg and milk mixture to the dry ingredients slowly and stir to form a soft dough. You might not need all of the egg and milk mixture so don't add it all at once. Kneed lightly and then roll out to around 2cm thickness on a floured work surface. Cut into 5cm rounds and put onto a greased baking tray. Brush the tops with milk and then bake in the oven at between 200C and 220C (depending on your oven) for around 15 minutes or until golden. Leave to cool slightly and then serve with strawberry jam and clotted cream. 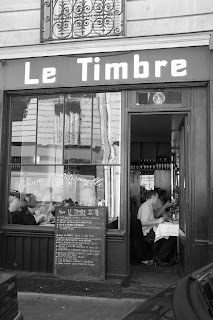 A beautiful sunny Friday in Paris and a pretty much faultless long, lazy lunch at probably the smallest restaurant I've ever been to - Le Timbre. 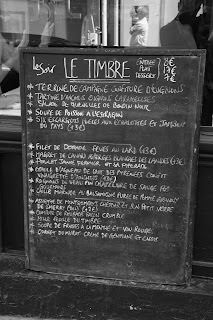 Le Timbre is a stone's throw from les jardins du Luxembourg in a little unassuming side street. It is, as it's name suggests, tiny. At best there's room for only around 20 people to eat at any one time and even then fitting everyone in at their tables is an intricate business. The minuscule kitchen with its solitary chef, Chris (originally from Manchester), is in full view of the restaurant so you see all of the food being prepared. We had the table closest to the kitchen which suited me as I could not only watch Chris at work but also have a quick chat with him and the waitress when they had time to spare (which to be honest wasn't all that often...). 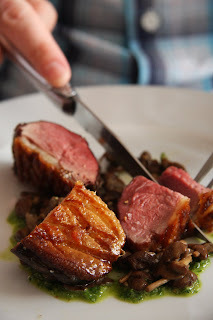 We kicked off with a glass of the crémant d'alsace whilst we pondered the short, but varied menu (and whilst I translated everything for Andrew). A good start. Feeling nicely rounded at the edges we ordered and decided to go for wines by the glass. Not cheap (with the current rather poor exchange rate) but well chosen and, given that this is a capital city restaurant, certainly acceptable. 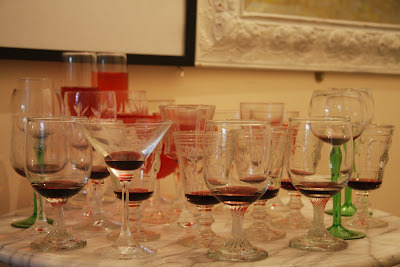 I have simply no idea what we drank though...probably too much! The service was friendly, relaxed and knowledgeable. You can ask about any dish and get a response in French or English. I don't eat meat and there was nothing on the menu without meat (even the fish dish) but that was soon sorted with a quick conversation with the waitress and the chef. 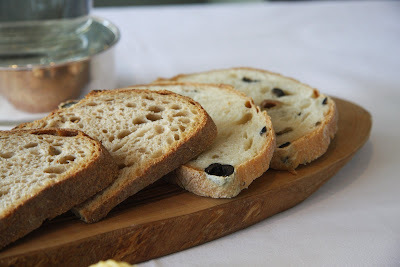 I started with the tartine d'anchois aux oignons caramelisés. I wasn't quite sure whether it was going to be superb or a total flop. Thankfully it was the former. 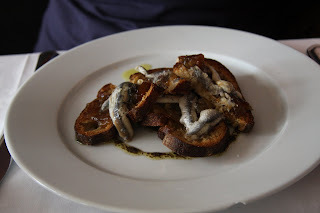 So simple - crisp toasted bread, plump tangy anchovies and sweet sticky onions. Who would have thought that the anchovies and caramelised onions would work so well together? Andrew went for the soupe de poisson a l'estragon. Rich and deep in flavour but unfortunately a little lost on a man who has no sense of smell. When it came to dessert there was no contest. We'd seen it pass by on the way to another table before we'd even ordered and decided we just had to leave room - mille feuille du timbre. 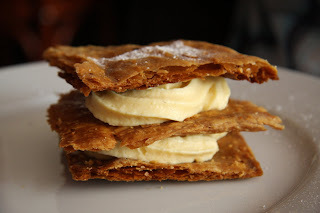 Three layers of crispy, sweet, flaky pastry interspersed with thick, rich vanilla custard. Sublime. Quite simply sublime. Go, just for this simple, yet luxurious dessert. In short, it's 'intimate', so much so that you feel like you're eating in someone's living room, but all the better for it. And the food is good - very, very good. A fellow northerner knocking the socks of his Parisian and international diners. Good on him.